Manchester is the largest city in the state of New Hampshire, the tenth largest city in New England, and the largest city in northern New England – an area comprising the states of Maine, New Hampshire, and Vermont. It is in Hillsborough County along the banks of the Merrimack River, which divides the city into eastern and western sections. Manchester is located less than 60 miles north of Boston. Incorporated as a city in 1846, Manchester would became home to the largest cotton mill in the world. Other products made in the community included shoes, cigars, and paper. The Amoskeag foundry made rifles, sewing machines, textile machinery, fire engines, and locomotives in a division called the Amoskeag Locomotive Works (later, the Manchester Locomotive Works). The rapid growth of the mills demanded a large influx of workers, resulting in a flood of immigrants, particularly French Canadians. Many current residents descend from these workers. 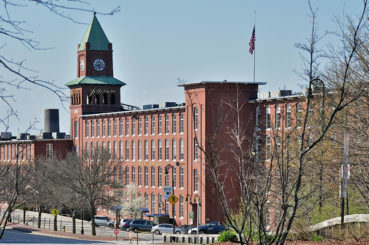 The Amoskeag Manufacturing Company went out of business in 1935, although its red brick mills have been renovated for other uses. Indeed, the mill town’s 19th-century affluence left behind some of the finest Victorian commercial, municipal, and residential architecture in the state. Nicknamed the Queen City, Manchester was named the “Number One Small City in the East” by Money magazine. The Mall of New Hampshire, on Manchester’s southern fringe near the intersection of Interstates 93 and 293, is the city’s main retail center. In 2001, the SNHU Arena, a venue seating more than 12,000, opened for major concerts and sporting events, enhancing the city’s downtown revitalization efforts with a major hotel and convention center already in place directly across the street from the arena. Northeast Delta Dental Stadium is a baseball park located on the Merrimack River in downtown Manchester and is home to the local AA-affiliate of the Toronto Blue Jays, the New Hampshire Fisher Cats. 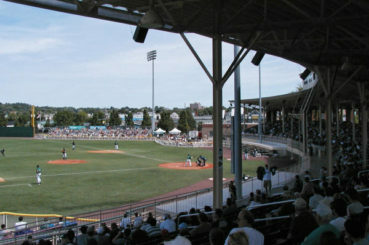 Historic Gill Stadium housed professional minor-league baseball into the early 21st century and continues to be a viable and popular downtown venue for many sporting and entertainment events, seating nearly 4,000 patrons, depending on the event format. 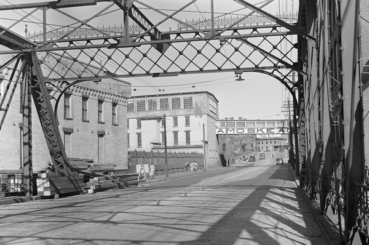 A look at the Amoskeag Mills from the Granite Street Bridge, circa 1936. Historic Gill Stadium as seen in 2004. Current day view of the Manchester Millyard. We encourage all of our runners flying in from out-of-town to fly into Manchester-Boston Regional Airport (MHT). Located about 10 minutes from the start/finish line. Manchester has a great public transportation system via city buses. All event locations and happenings including the SNHU campus for the race expo and Penmen for Patriots 5k are available via public transport. Please visit the Manchester Transit site for more information and bus schedules.